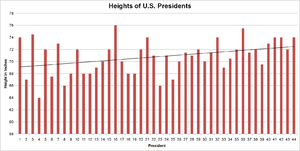 Presidents have grown taller over time as shown using linear trend estimation. A record of the heights of the Presidents of the United States and presidential candidates is useful for evaluating what role, if any, height plays in presidential elections. Some observers have noted that the taller of the two major-party candidates tends to prevail, and argue this is due to the public's preference for taller candidates. 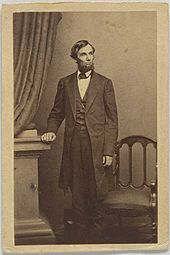 The tallest U.S. President was Abraham Lincoln at 6 feet 4 inches (193 centimeters), while the shortest was James Madison at 5 feet 4 inches (163 centimeters). Donald Trump, the current President, is 6 feet 3 inches (191 centimeters)[disputed – discuss]. Mike Pence, the current Vice-President, is 5 feet 10 inches (178 centimeters). Abraham Lincoln at 6 ft 4 in (193 cm) surmounts Lyndon B. Johnson as the tallest president. James Madison, the shortest President, was 5 ft 4 in (163 cm). Various folk wisdoms about U.S. presidential politics put forward the view that the taller of the two major-party candidates always wins or almost always wins since the advent of the televised presidential debate. There is more data if the relationship of electoral success to height difference starts from the year 1900, rather than from the beginning of televised debates. In the twenty-eight presidential elections between 1900 and 2011, eighteen of the winning candidates have been taller than their opponents, while eight have been shorter, and two have been of the same height. 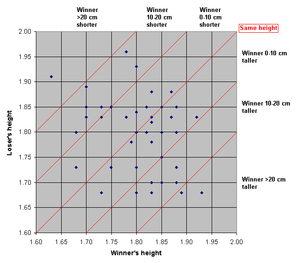 On average the winner was 1.0 inch (2.5 cm) taller than the loser. In Ray Bradbury's 1953 dystopian novel Fahrenheit 451, when Mildred and her friends talk about the success of one presidential candidate over the other in a recent election, they talk only about the attractiveness of the winning candidate over the loser. One of their points is "You just don't go running a little short man like that against a tall man." A 1988 article in the Los Angeles Times fashion section about a haberdasher devoted to clothing shorter men included a variation of the tale: "Stern says he just learned that Dukakis is 5 feet, 8 inches. 'Did you know,' he adds, noticeably disappointed, 'that since 1900 the taller of the two candidates always wins?'" A 1997 book called How to Make Anyone Fall in Love with You discusses the issue in a section about the importance of height: "What about height? One assumes the taller the better, because our culture venerates height. In fact, practically every president elected in the United States since 1900 was the taller of the two candidates." A chapter titled "Epistemology at the Core of Postmodernism" in the 2002 book Telling the Truth: Evangelizing Postmodernisms makes this observation: "I remember the subversive effect the observation had on me that in every U.S. presidential race, the taller of the two candidates had been elected. It opened up space for a counterdiscourse to the presumed rationality of the electoral process." A 1975 book called First Impressions: The Psychology of Encountering Others notes: "Elevator Shoes, Anyone? One factor which has a far-reaching influence on how people are perceived, at least in American society, is height. From 1900 to 1968 the man elected U.S. president was always the taller of the two candidates. (Richard Nixon was slightly shorter than George McGovern.)" A 1978 book titled The Psychology of Person Identification states: "They also say that every President of the USA elected since the turn of the [20th] century has been the taller of the two candidates (Jimmy Carter being an exception)." A 1999 book, Survival of the Prettiest by Nancy Etcoff, repeated a version of the legend in a section on the power of heights: "... Since 1776 only [two Presidents,] James Madison and Benjamin Harrison[,] have been below-average height. The easiest way to predict the winner in a United States election is to bet on the taller man: in this century you would have had an unbroken string of hits until 1972 when Richard Nixon beat George McGovern." A comparison of the heights of the winning presidential candidate with the losing candidate from each election since 1789 is provided below to evaluate such views. ** Lost the House of Representatives vote, but received the most popular votes and a plurality of electoral votes; however, not the majority needed to win. Mr. Lincoln's height was six feet three and three-quarter inches "in his stocking-feet." He stood up one day, at the right of my large canvas, while I marked his exact height upon it. A disputed theory holds that Lincoln's height is the result of the genetic condition multiple endocrine neoplasia type 2b (MEN2B); see medical and mental health of Abraham Lincoln. Only slightly shorter than Lincoln was Lyndon B. Johnson (6 ft 3 1⁄2 in or 192 cm), the tallest President who originally entered office without being elected directly, and President Donald Trump (6 ft 3 in or 191 cm). 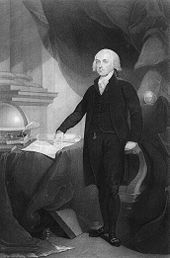 The shortest President elected to office was James Madison (5 ft 4 in or 163 cm); the shortest President to originally enter the office by means other than election is tied between Millard Fillmore and Harry S. Truman (both were 5 ft 9 in or 175 cm). The tallest unsuccessful presidential candidate (who is also the tallest of all presidential candidates) is Winfield Scott, who stood at 6 ft 5 in (196 cm) and lost the 1852 election to Franklin Pierce, who stood at 5 ft 10 in (178 cm). The second tallest unsuccessful candidate is John Kerry, at 6 ft 4 in (193 cm). The shortest unsuccessful presidential candidate is Stephen A. Douglas, at 5 ft 4 in (163 cm). The next shortest is Hillary Clinton, who lost the 2016 election and is 5 ft 5 in (165 cm). The largest height difference between two presidential candidates (out of the candidates whose heights are known) was in the 1860 election, when Abraham Lincoln stood 12 inches (30 cm) taller than opponent Stephen A. Douglas. The second-largest difference was in the 1812 election, with De Witt Clinton standing 11 inches (28 cm) taller than incumbent James Madison. The 2016 election between Donald Trump and Hillary Clinton has the third largest difference at 10 inches (25 cm), and is notable for being the first time two candidates from major parties are of different genders. ^ As some examples, USA TODAY listed height among six criteria for predicting who would win the 2004 election; a Washington Post blog Archived July 29, 2012, at the Wayback Machine noted the significance of height in physical appearance and its effect on voters. See the discussion of this phenomenon later in the article for further examples. ^ a b c Jackson, Ronny L. (January 16, 2018). "The President's Periodic Physical Exam" (PDF). whitehouse.gov. ^ Flores, Reena (September 17, 2016). "Mike Pence releases doctor's note on medical records". CBS News. Retrieved May 30, 2017. ^ a b Carpenter, Francis B. (1866). Six Months in the White House: The Story of a Picture. Hurd and Houghton. p. 217. ^ Dallek, Robert (1998). Flawed Giant: Lyndon Johnson and His Times, 1961–1973. Oxford University Press. p. 12. ISBN 978-0195054651. ^ Caro, Robert (1982). The Years of Lyndon Johnson: The Path to Power. New York: Knopf. p. 146. ISBN 978-0394499734. ^ a b Producer, Kevin Liptak, CNN White House. "White House doctor: 'No concerns' about Trump's cognitive ability". ^ Gabbatt, Adam (January 17, 2018). "A tall tale? Accuracy of Trump's medical report – and new height – questioned". the Guardian. Retrieved August 5, 2018. ^ a b c d e f g h i j k l m n o p q r s t u v w x y z aa ab ac ad ae af Kane, Joseph (1994). Facts about the Presidents: A Compilation of Biographical and Historical Information. New York: H. W. Wilson. pp. 344–45. ISBN 0-8242-0845-5. ^ Macdonald, Zanne (July 1992). "Physical Descriptions of Thomas Jefferson". Monticello Report. Monticello Research Department. Archived from the original on July 13, 2009. Retrieved May 17, 2009. ^ a b c d Page, Susan (June 23, 2004). "Time-tested formulas suggest both Bush and Kerry will win on Nov. 2". USA TODAY. Retrieved May 13, 2009. ^ Sommers, Paul M. (January 2002). "Is Presidential Greatness Related to Height?". The College Mathematics Journal. 33 (1): 14–16. doi:10.2307/1558973. ^ Sedghi, Ami (October 18, 2011). "Statesmen and stature: how tall are our world leaders?". The Guardian. ^ Mathews, Jay (August 3, 1999). "The Shrinking Field". The Washington Post. ^ a b "Presidential Height Index". The Height Site. Archived from the original on August 23, 2012. Retrieved August 22, 2012. ^ Hendriks, Steven (2017). "JFK Presidential Library". The John F. Kennedy Presidential Library and Museum. Retrieved April 19, 2009. ^ Office of the Press Secretary (February 28, 2010). "Release of the President's Medical Exam" (PDF). The White House. Archived from the original (PDF) on March 25, 2010. Retrieved March 1, 2010. ^ Mann, Simon (March 2, 2010). "Fit for duty: Obama gets clean bill of health". Sydney Morning Herald. Fairfax Digital. Retrieved March 1, 2010. ^ a b c d e Tossey, Lisa D. (2004). "Is presidential race a simple matter of standing tall?". The Pendulum Online. Retrieved April 19, 2009. ^ Nash, George H. (1988). The Life of Herbert Hoover. W.W. Norton & Company. p. 365. ^ "Report on President Bush's Physical Examination". New York Times. August 2, 2006. ^ "Medical History Summary: President George W. Bush". FindLaw. August 7, 2007. Retrieved March 2, 2010. ^ Scott, David (October 18, 2011). "GOP Debate: Does height matter in presidential politics?". The Christian Science Monitor. ^ Davison, Kenneth E (1972). The Presidency of Rutherford B. Hayes. Westport, Connecticut: Greenwood Press, Inc. p. 69. ISBN 0-8371-6275-0. ^ Mathews, Jay (September 24, 2015). "Is Hillary Clinton getting taller? Or is the Internet getting dumber?". The Washington Post. ISSN 0190-8286. Retrieved August 19, 2016. ^ "The Shrinking Field". The Washington Post. August 3, 1999. Retrieved April 27, 2009. ^ a b Dowd, Maureen (June 21, 1992). "Where They Stand". The New York Times. Retrieved May 13, 2009. ^ a b c d e f g h i j k Gillis, John S. (1982). Too Tall, Too Small. Champaign, Illinois: Institute for Personality and Ability Testing, Inc. p. 20. ISBN 0-918296-15-3. ^ "Wendell Willkie". imdb.com. Retrieved December 1, 2016. ^ Morris, Charles E. (1920). Progressive Democracy of James M. Cox. The Bobbs-Merrill Company. p. 9. ^ Gillis, Too Tall, Too Small, p. 20. Lists his height as 5 ft 10 in (178 cm). ^ Edwards, Rebecca; DeFeo, Sarah (2000). "William Jennings Bryan". 1896: The Presidential Campaign. Vassar College. Retrieved April 20, 2009. Lists his height as 5 ft 10 in (178 cm). ^ Wilson, Charles Morrow (1970). The Commoner: William Jennings Bryan. Garden City, N.Y.: Doubleday. p. 40. Lists his height as 5 ft 11 in (180 cm) during his second year in college. ^ Springen, Donald K. (1991). William Jennings Bryan: Orator of Small-Town America. Greenwood Press. p. 15. ISBN 0-313-25977-1. Lists his height as 6 ft 0 in (183 cm). ^ Records of his height have been difficult to obtain. In one biography, he was described as "just under six feet in height". While not a definitive record of his height, this description does allow us to presume he was at least comparable in height to Cleveland. See Crawford, Thomas Clark (1893). James G. Blaine: A Study of his Life and Career, from the Standpoint of a Personal Witness of the Principal Events in his History. Edgewood Publishing Co. p. 26. Retrieved June 26, 2009. ^ Jordan, David M. (1988). Winfield Scott Hancock: A Soldier's Life. Bloomington and Indianapolis: Indiana University Press. p. 23. ISBN 0-253-36580-5. ^ Bigelow, John (1895). The Life of Samuel Tilden (vol. 1). New York: Harper and Brothers. p. 283. ^ Stoddart, Henry Luther (1946). Horace Greeley: Printer, Editor, Crusader. New York: G. P. Putnam's Sons. p. 38. ^ Eckenrode, Hamilton James; Bryan Conrad (1941). George B. McClellan, the man who saved the Union. University of North Carolina Press. p. 2. Retrieved June 26, 2009. ^ Davis, William C. (1974). Breckinridge: Statesman, Soldier, Symbol. Baton Rouge: Louisiana State University Press. p. 18. ISBN 0-8071-0068-4. ^ Johanssen, Robert W. (1973). Stephen A. Douglas. New York: Oxford University Press. p. 4. ^ Life of John Charles Fremont. New York: Greeley & McElrath. 1856. p. 31. Retrieved July 6, 2009. ^ Heidler, David Stephen (2004). Encyclopedia of the War of 1812. Naval Institute Press. p. 464. ISBN 1-59114-362-4. Retrieved May 17, 2009. ^ According to Cass's biography, he was "about five foot eight or nine inches". See Woodford, Frank B. (1950). Lewis Cass: The Last Jeffersonian. New Brunswick and New Jersey: Rutgers University Press. p. 32. ^ Seymour, Chas C. B. (1858). Self-made men. New York: Harper & Brothers. p. 137. Retrieved July 6, 2009. ^ Scott, Nancy N. (1856). A Memoir of Hugh Lawson White, Judge of the Supreme Court of Tennessee, Member of the Senate of the United States, etc., etc. Michigan: J. B. Lippincott & Co. p. 243. Retrieved June 25, 2009. ^ Mooney, Chase Curran (1974). William H. Crawford, 1772-1834. Michigan: University of Kentucky Press. p. 7. ISBN 0-8131-1270-2. Retrieved June 25, 2009. ^ One biography of Crawford describes his stature as being "considerably over six feet". See Butler, Benjamin F. (1824). Sketches of the Life and Character of William H. Crawford. Albany: Packard and Benthuysen. p. 35. ^ Sotos, John G. (2008). The Physical Lincoln. Mt. Vernon Book Systems. ISBN 978-0-9818193-2-7. Kane, Joseph (1993). Facts about the Presidents: A Compilation of Biographical and Historical Information. New York: H. W. Wilson. ISBN 0-8242-0845-5. Sommers, Paul M. (January 2002). "Is Presidential Greatness Related to Height?". The College Mathematics Journal. 33 (1): 14–16. doi:10.2307/1558973. Gillis, John S. (1982). Too Tall, Too Small. Champaign, Illinois: Institute for Personality and Ability Testing, Inc. ISBN 0-918296-15-3. Stats: Does the taller man always win? The Straight Dope: Does the taller candidate always win the election? This page was last edited on 14 April 2019, at 08:17 (UTC).